CHESTERTOWN, MD—The Washington College women’s soccer team was back on campus safe and sound after a bus fire en route to their first game of the season. 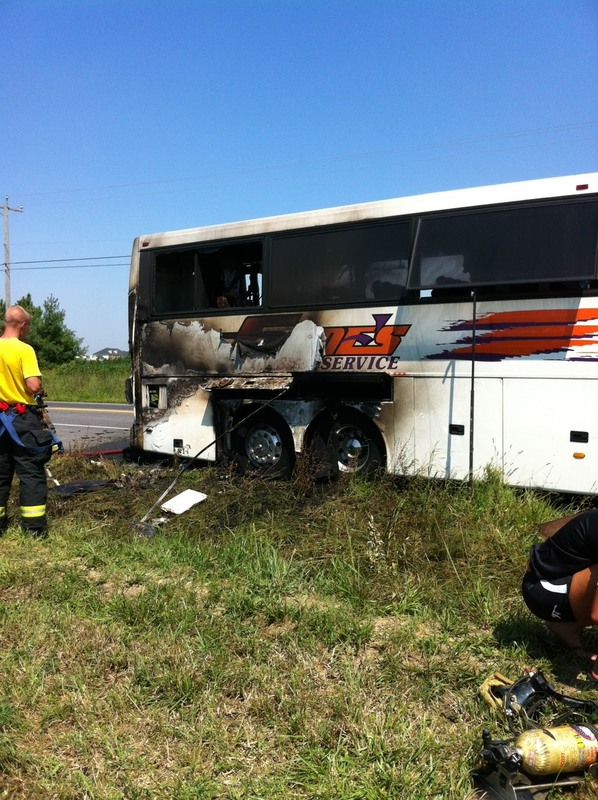 The team was barely out of Kent County, not yet to Church Hill on Maryland Route 213, when the bus taking them to their afternoon game at Randolph-Macon College in Ashland, Va., caught fire. Team members seated at the back of the bus first noticed smoke coming in from a vent near the bathroom. They alerted the team coaches and the driver, who pulled over to the side of the highway. Players say there was one panicky moment when the hydraulic system that opened the coach’s doors failed, but the driver was able to open the door manually. The team waited a safe distance from the bus and watched as smoke turned to flame. Local volunteer firefighters arrived to put out the fire, and College vans transported the players back to campus. There they met with a team of administrators and counselors that included Athletic Director Bryan Matthews, two health center crisis counselors and Director of Student Development Beth Anne Langrell. Although most of the passengers were able to get their personal items off the bus, a handful of the players did lose valuables that included electronics. The bus was operated by Gene’s Limousine Service, based in Federalsburg, Md. The College is awaiting the results of the investigation into the fire being conducted by the State Fire Marshal and the Maryland State Police. The game against Randolph-Macon has been postponed without a make-up date. On Sunday, September 2, the Shorewomen travel to Allentown, Pa., to play Cedar Crest College. That game begins at 2 p.m.